Why Online Reviews are Important? This is a good example of why companies need to monitor their online reputation. Here is a phony review to a mental health facility. I’m not sure why people do this. It may be boredom, maliciousness or even a disgruntled employee. Luckily, these clients are able to monitor their online reviews and are then able to respond to these false reviews. 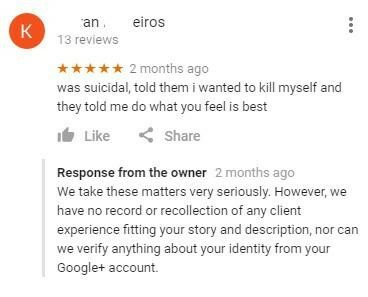 Sometimes you can dispute these online reviews with the website but it’s always best to respond as this client did. © 2016 peorialocalseo. All rights reserved.